The holiday season can be a stressful (and expensive) time of year. You have to worry about hosting Christmas dinner, buying gifts for everyone, and decorating your home all without breaking the bank. Luckily, there are plenty of tools to help you enjoy the holiday season while spending Christmas on a budget. Setting a budget and finding ways to save money for Christmas can be a fun challenge and will teach you a lot about how to effectively manage your money. 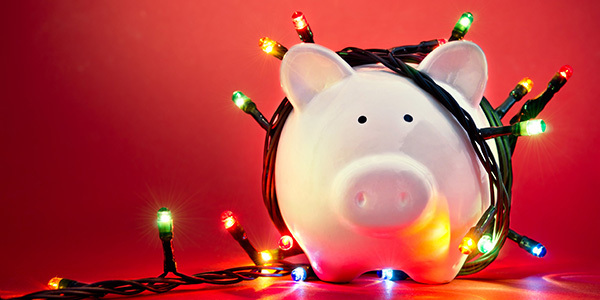 Check out these tips to survive Christmas on a budget to help you save money this Christmas. The best way to ensure that you don’t overspend this holiday season is to set a Christmas shopping budget. Start by breaking down each category of expenses you will be tackling this Christmas. Set a specific budget for every person you are going to be getting a gift for. Next, set a budget for any food you will be making. Make sure you account for cookies, Christmas dinner, refreshments, and any other meals you typically cook. If you will be traveling for Christmas, set aside a budget for gas, tolls, flights, or hotel accommodations. Make sure to also account for any food you will be buying during your travels. If you need to buy decorations, you should also set aside a budget for them. A great way to save on decorations is to either buy them secondhand at a thrift store or to wait until the end of the season when all decorations go on sale. If the idea of budgeting seems daunting, there are some tools that can help. Downloading a Christmas budget app can help you keep track of all money coming in and leaving. It may also benefit you to open a separate bank account specifically for Christmas. Many banks have a very low minimum, so you can begin the account early in the year and put all extra cash into it. By the holiday season, you will know how much money you have in your Christmas budget. Plus, you can see how much you have spent or have left to spend at any given time. There are also plenty of Christmas budget spreadsheets you can download and update as you spend your money. This is another great tool to help you actively track your spend and ensure you don’t go over your budget this year. Cyber Monday and Black Friday are great times to snag special deals on any big-ticket items you want to buy for Christmas. Keep an eye out for the Black Friday ads about a week before Thanksgiving, and Cyber Monday ads shortly after. Find the items you want and make sure to compare between a few stores to get the best deals. Keep in mind that stores like Kohl’s will offer their own cash back rewards, and Target often provides gift cards with specific purchases. If you have a store-specific credit card, you may even receive more special discounts and rewards. If Black Friday shopping stresses you out, look to see if stores offer the same promotions online. You can often find the same Black Friday deals, and may even get an extra promo code that could save you even more money. If you forget the snag the special deals on Black Friday, Cyber Monday is another chance to save money on your Christmas gifts. Some stores may extend their Black Friday deals, while others completely change their specials. Make sure to price check between several sites on Cyber Monday to ensure you are getting the best deal. Some sites offer lower prices, but shipping may put their prices over the edge. Have a game plan and stick to it to save hundreds on gifts before December even hits. Holiday sales aren’t the only way to save money this Christmas. Apps and browser extensions can help you track sales, promo codes, and price changes to make sure you always have the best deal. One helpful tool is the honey extension for chrome. All you have to do is download honey as an extension to your Google Chrome. It will run in the background while you shop. When you go to check out, honey will pop up and run all promo codes in its system for the site you are on. In some cases, honey will also offer cash back rewards for your purchase. If you are shopping on Amazon, honey will let you know if you have the best deal on the item you are going to buy. They will also provide historical pricing for the item to let you know if it recently rose in price or if this is the lowest price it’s been. You can add items to a “drop list” which will alert you if the items drop in price. Once you have everyone’s wish list, you should add everything to your drop list to make sure you are buying at the lowest price possible. The second helpful tool for saving money this Christmas is the Paribus app from Capital One. Once you sign up through Paribus, the tool begins scanning for confirmation emails in your inbox. If the retail price of something you purchased drops, they will help you get your money back and receive the discounted price. They will also track shipments and help you receive compensation for late deliveries. If you are traveling for the holidays and need to book a hotel room, Paribus will look for lower rates and alert you if you have an opportunity to save money. They will then help you rebook at the lower price. If you haven’t given much thought towards your credit cards, now is the perfect opportunity. Unless you will be paying for your expenses with cash, you will likely be putting a lot of your purchases on a credit or debit card. Cash back credit cards are a great way to save a little bit more money during the holiday season. You’ll want to look for a credit card with low to no yearly fees that offer cash back on specific purchases. You can find a comprehensive list of credit cards and their cash back offers here. You may also consider a card specific to a store that you shop at a lot. For example, the Target REDcard gives you 5% cash back on your purchases, plus perks like free shipping. The Amazon Prime Rewards Visa card gives you 5% cash back at Amazon or Whole Foods, 2% cash back at restaurants, gas stations, and drug stores, plus 1% cash back on all other purchases. Other retail stores like Kohl’s, TJX (TJ Maxx, Marshall’s, Home Goods), and GAP offer their own credit cards. Cash back does not have to just come from your credit card! You can also download apps like Ibotta or Drop to earn extra cash. Ibotta will give you cash back for purchases after scanning your receipt, whereas Drop connects to your credit card to give you cash back from specific retailers. If you shop online often, consider signing up for a Swagbucks account. They offer cash back ranging from 1% to 10% on lots of different sites. You can redeem your Swagbucks in the form of gift cards or charitable donations. Save money on Christmas gifts this year by thinking outside of the box. When it comes to clothing and accessories, your first instinct may be to go directly into the store and buy an item full price. There may be a cheaper solution to still get brand new clothing without paying the big retail price. Sites like eBay and Poshmark sell new and used clothing at a discounted price. Often, the clothes are coming from online resellers, who reduce the original price of these items significantly so that you choose to buy from them instead of directly from the store. These sites offer lots of new with tags (NWT) products for drastically lower prices. Unless stated, these items are usually in perfect condition. Instead of buying a brand new designer coat for $300, you can usually find the same NWT coat on sites like Poshmark or eBay for around $150. Plus, features like “make an offer” can let you haggle prices and save even more money on your Christmas gifts. Once you start buying on these sites, you won’t believe you ever paid full price for anything ever again. If someone on your Christmas list is asking for a gift card this Christmas, don’t go directly to that store to buy it. Instead, do all of your gift card shopping at your local grocery store. Many grocery stores have gas rewards programs if you spend a certain amount with them. For example, some stores offer 10 cents off on gas for every $100 you spend. If you have a lot of gift cards to buy, this could really add up and save you a ton next time you need to fill up your tank. If you really want to rack up the savings, plan ahead for where you plan to shop. You know you’ll be doing all of your holiday shopping on Amazon, so stock up on gift cards at the grocery store. It’s money you’d be spending anyway, but now you get to save on gas as well. Make sure to check your grocery store’s rules and regulations to see if gift cards are included in their loyalty program. Depending on your cash back credit card, you may even receive cash back on your purchase, as you made it at a grocery store. Hosting a large number of people can get expensive very quickly. Plus, it’s a huge amount of work! If you are having a lot of people over, whether it is co-workers, friends, or even family, suggest a potluck. This will take a lot of the pressure off of you when it comes to cooking and buying food for a large number of people. Usually, everyone is happy to participate and bring a casserole or dip to the event. It saves you from over-buying and wasting food and allows everyone to contribute. Plus, it’s fewer dishes for you to clean! Cooking one or two potluck dishes is a lot more cost effective than making twenty different dishes. Now, the money you would have spent on food can either go to other things in the Christmas budget or back into savings. If you have a big family, buying gifts for everyone can become really expensive. Instead, suggest doing a secret Santa or white elephant. Everyone still receives a thoughtful gift, but you don’t have to buy an individual gift for every single person in the room. Make secret Santa easy by using a secret Santa generator. It will produce a secret Santa questionnaire for people to answer with their wish list. Then, everyone will be sent the name of the person they must buy a gift for. You can anonymously communicate with your secret Santa through the generator if you have any questions. Then, at Christmas, everyone will bring their gifts, and one by one everyone’s secret Santa will be revealed. This adds a lot of fun and anticipation to Christmas and allows you to be more thoughtful since you only have to focus on one single gift. If you are not interested in doing a secret Santa, a white elephant gift exchange may be the way to go. Unlike secret Santa, no names are selected for the white elephant gift exchange. Instead, everyone buys a present within a certain pre-determined budget. Everyone will wrap their gift and put them in a pile on Christmas day. Then, have everyone select a random number. Starting at number one, people will choose their random gift and open it. The next person to choose can either steal someone else’s unwrapped gift or open a new one. Gifts can only be stolen 3 times before they are officially off-limits. This is a great option if you do not want to buy specific gifts, but still want to partake in a gift exchange. If you are hosting Christmas dinner or even just making Christmas cookies, it’s time to rethink your loyalty to name brands. Generic brands get a bad rep, but they are usually more similar to name brands than you think. In fact, in blind taste tests, many people could not tell the difference between generic and name brand foods. Some even preferred the generic brand over the name brand. At the end of the day, you’re usually paying more for the brand, not the actual product. Consider making the switch this year to save money on groceries. For example, name brand pie crust costs around $3.50, whereas generic brand pie crust comes in around $1.50. That’s $2 savings per pie. Assuming all generic food is approximately $2 cheaper than the name brand, you could easily save at least $100 on Christmas dinner. Don’t wait until Black Friday to look for deals. If you know what you are looking for, start scoping out sales and promotions as early as possible. Sign up for store loyalty programs and promotional emails to stay up-to-date on any special deals. The best deals are often at the end of a sales quarter or at the end of a season. Keep an eye out during these times for special sales. Remember to put specific items on your drop list to see if their prices go down. If you are really set on never missing an announcement about something, consider signing up for Google alerts about them. If anything is ever posted online with the name of the item, you will get an alert from Google. The best thing you can do is give yourself time to get all of the best deals. If you wait until the last minute, you’ll end up rushing and overspending. If you follow these 10 tips for surviving Christmas on a budget, you are sure to save money on Christmas this year. Remember: set a budget, participate in Black Friday and Cyber Monday, utilize money-saving tools, take advantage of cash back, get creative with potlucks and secret Santa, go generic, and always be on the lookout for sales. Even if you decide to only follow a few items on this list, you are sure to save money this Christmas. We wish you and your family the very best this holiday season. For more Christmas tips, head over to our Pinterest.